Say POLE DANCING. I know right. You are thinking of drag dancing, cabaret or even a whore house. 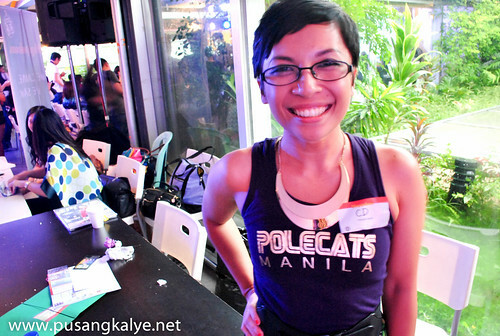 I was kinda skeptical when I learned that Pole Cats Manila is one of the partners of the 1st Blogapalooza event last month. I was thinking, what are they doing here? I thought they will be providing entertainment to bloggers. An intermission number in between presentations of different sponsor brands perhaps to break the monotony? I began by asking her, WHY POLE DANCING? She said, why not? I said, the perception is that it's vulgar, she said, "you saw the performance, was it vulgar?" I said no. And I mean it. She continued by saying because pole dancing aside from the fact that it's an art, it is a good way to stay fit. Makes sense.I guess my mind was too busy with the wrong perception, with the malice , that I failed to see beyond it. The group has this for its mission: "To change how women view their bodies, and to promote a healthy, fit, active lifestyle without denying that yes, our femininity is one of the best weapons we own." I stopped asking and let it sink in my consciousness instead with the memories of the pole dance performance playing in my memory. 1. Wear short shorts and do NOT put lotion. 2. Bring towel and water. 3. Come hydrated, but NOT on a full stomach. 4. Classes start and end on time. 5. If it's your first class, come 15 mins early to fill out some forms. 6. Latecomers will not be allowed to join class. 7. Male companions are not allowed to watch. 8. If bringing kids, please make sure they do not disrupt class or make a mess. 10. Classcards are non-refundable and non-transferable. Ploe Cats Manila is Across UA&P and same building as Starbucks and Pancake house. husay ng pole dancers. dati kasi pag sinabi na pole dancers, yung tipong sa club at pasexy lang at walang acrobatic movements. now, with open mindded pips, mas na-aapreciate ito. Alam mo just saw Ciara Sotto in eat bulaga today doing a pole dance number. Ang ganda ng body niya ngayon. question lang, do they offer separate classes for guys? maganda siyang exercise. @khanto, enroll tayo pag meron? Ladies and Mens class are separate. Our Mens workshop begins this November.